Called "The 'Ticking Time Bomb' That Could Cause Such Rapid Global Warming We'd Be Unable to Prevent Extinction, you might like to pass this around to your more literate friends and family. "Our planet has experienced five major extinctions over the past billion or so years -- do we really want to launch an irreversible 6th? 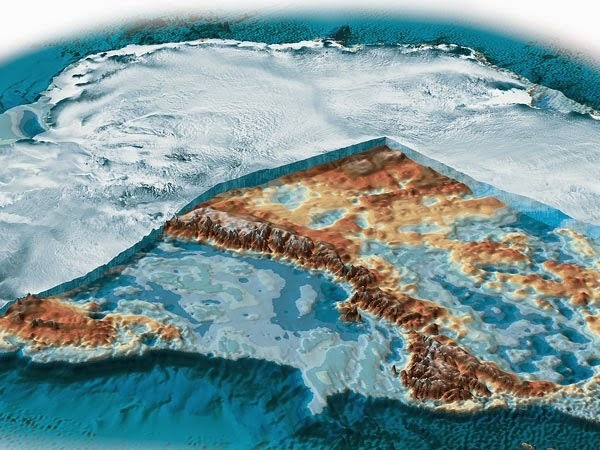 "If, 250 million years ago, you were standing thousands of miles away from what is now Siberia in the first years of the Permian Mass Extension, probably the most you would notice is an odd change in the weather and a reddish hue in the northern sky. What you wouldn’t know, and probably your children wouldn’t even realize –although their grandchildren probably would – is that a tipping point had already been passed, and an extinction – an unstoppable one – was already underway. "What could get America’s leading experts on climate change to agree on something that the average American has probably never even heard of? 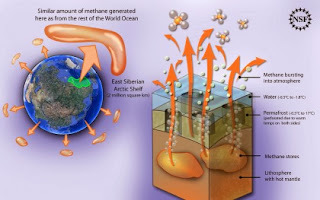 "Methane is a far more potent greenhouse gas than carbon dioxide, and there are trillions of tons of it embedded in a sort of ice slurry called methane hydrate or methane clathrate crystals in the Arctic and in the seas around continental shelves from North America to Antarctica. 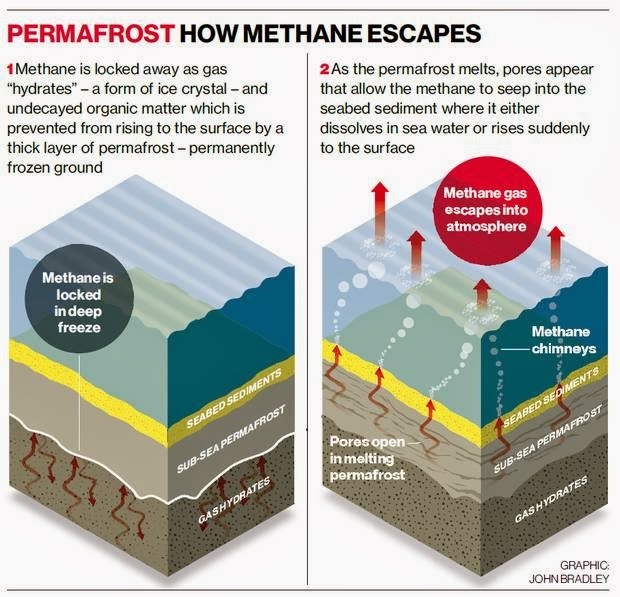 "If enough of this methane is released quickly enough, it won’t just produce 'Global warming.' It could produce an extinction of species on a wide scale – an extinction that could even include the human race. "If there is a 'ticking time bomb' in our biosphere that could lead to a global warming so rapid and sudden that we would have no way of dealing with it, it’s methane. 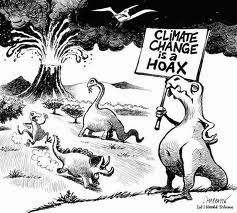 "Our planet has experienced five major extinctions over the past billion or so years, times when more than half of all life has died in a geologically brief period of time, and the common denominator of each one has been a sudden pulse of global warming. Increasingly, it appears that a rapid release of methane played a primary role in each one. "Back in 2002, the BBC documented how, just in the previous decade, geologists had by-and-large come to the conclusion that a sudden release of methane led to the death of over 95% of everything on Earth during the Permian Mass Extinction. That methane is back, probably in even larger quantities, as life has been so active since the last mass extinction. "We laid out the scenario and its possible doomsday implications in a short video titled 'Last Hours' a few months ago. Since the world has been recently sensitized about methane, we’re now discovering more and more of it leaking from oil wells, fracking operations, melting permafrost, and even stirred up by Arctic storms. "While methane does eventually degrade into carbon dioxide, when large amounts are released over a short time period, their effect on global warming can be dramatic, since methane is such a more potent greenhouse gas than carbon dioxide. "Carbon dioxide in our atmosphere has passed 400 ppm, a number never before seen in human history, but we’ve also never seen methane releases on this order in human history. And, to a large extent, the naturally occurring methane releases are the result of that 400 ppm of carbon dioxide. "While many of the methane releases are the result of fossil fuel extraction processes, the most dangerous ones – the ones that could lead to trillions of tons of methane escaping into the atmosphere and driving an extinction event – are from the melting of frozen methane clathrate crystals along the seabeds. 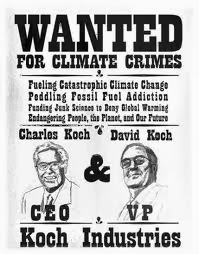 And the process that drives that is global warming, principally driven by carbon dioxide. "If we want to avoid an extinction that could approach or even rival some of the five past extinctions that have wiped out so much of life on earth, we must get control, quickly, of our man-made carbon dioxide and methane releases." It might strike some that the recent efforts by the Conservative class to destroy the economy, then pointing fingers at Progressives to then usher in the New Age of American Feudalism pale compared to the sudden extinction of most all living beings on the planet. 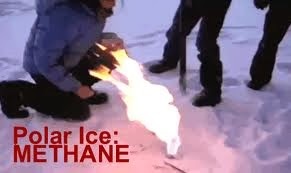 At the very least, "A release of methane in the Arctic could speed the melting of sea ice and climate change with a cost to the global economy of up to $60 trillion over coming decades, according to a paper published in the journal Nature," according to an article by Nina Chestney at Huffingtonpost.com. We've warned Conservative leaders and their propagandists that when the tipping point of global warming becomes obvious to the populace that climate change deniers would be chased down the streets and hung from the nearest lamp post, but with the sudden effects of methane releases, people might not have the time. Have we reached the tipping point? Will new fallout shelters backed with centuries worth of oxygen-enriched storage tanks become popular with those that can afford them? If not, we had better criminalize Conservatism and use the world's resources to stop the melting of the ice caps NOW. Thomas Jefferson, letter to Dr. Thomas Cooper, February 10, 1814.